The king of bubble shooters is back with two brand new game modes: Adventure and Blitz! 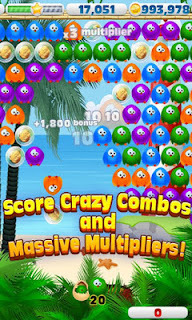 Take on the Bubble Birds Adventure by yourself or compete with friends on every level and in weekly Blitz tournaments! ★explore 7 different, colorful islands (and a ton of levels) in the Adventure mode! ★score HUGE bonuses and MAX OUT your multipliers to beat your friends’ high scores across all the Adventure levels! ★master all of the special birds – Bomb Bird, Rainbow Bird, Cash Bird, the NEW Lightning and Painter Birds and many others! ★post the highest score you can in the exciting, new, 60-second Blitz mode! ★challenge and compete with your friends in weekly competitions! ★unleash the mighty new FIREBIRD in both Adventure and Blitz modes! ★FREE updates with new levels, new birds, obstacles, power-up boosts and challenges! ★easy to learn, challenging to master!